As he explained the process of how the trade came to fruition, Exec. VP of Basketball Operations John Paxson in his opening comments on Tuesday at the United Center praised Deng but illustrated why parting ways was best for the organization. Deng leaves as the fourth leading scorer in team history. And for all he did on the court, Deng’s character and how much he gave back to his community were equally impressive, which is exactly why Paxson and the Bulls were faced with such a challenging dilemma. Bulls coach Tom Thibodeau echoed that sentiment. Carlos Boozer spoke about the trade after Chicago’s morning shootaround. It was an emotional day for many in the organization, but as Paxson explained, it came as a result of doing what needed to be done. Paxson started by looking back to the beginning of the 2013-14 season when expectations were high with Derrick Rose’s return. The Bulls were considered to be among the elite in the Eastern Conference with a chance of returning to the NBA Finals for the first time since 1998. “That was our belief and our goal,” stated Paxson. “When Derrick had the injury against Portland and we learned that surgery was going to keep him out the remainder of the year, at that time our focus had to broaden a little bit. 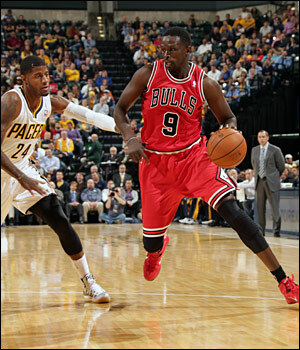 The Bulls were searching for a way to keep Deng while maintaining the ability and resources to build the team for the future. “The offer that we made was rejected, which is absolutely Lu’s prerogative and his right to do so,” stated Paxson, who acknowledged Deng’s ability to become a free agent, saying he wouldn’t want a player to accept a deal unless he is comfortable with it. 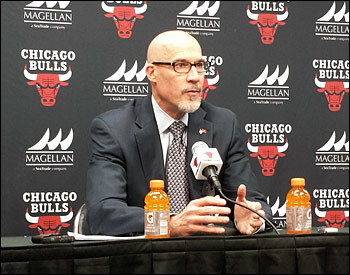 It was over this past weekend, explained Paxson, when the Bulls recognized the distance between the parties with respect to arriving at an agreement. That put into motion what ultimately resulted in the deal. As for the present, Paxson knows what he expects out of the team. Paxson has always placed a premium on character when it comes to adding players to the roster. Now more than ever, he believes that the Bulls will continue to go about their business in a professional way. While removing Deng from the roster will present challenges, Paxson also sees opportunities with Jimmy Butler’s continued growth and Tony Snell’s development. The Bulls will also rely on veteran Mike Dunleavy to pick up the slack from Deng’s departure. “I would never ever discount what our basketball team will do this year,” said Paxson. “Rebuilding is not a word that you use when you have players like Joakim Noah on your team and you still have Derrick Rose, who we fully expect to come back healthy [next season]. You don’t rebuild when you have a coach like Tom. Just after noon on Tuesday, Deng used social media to say goodbye. While Deng embodied many of the things this organization stands for, as Paxson noted, there are still a number of high character players in the Bulls locker room. They’ve been through adversity before, but they continue to show up and do their jobs. There’s no reason to expect this time around will be any different.